A Neuroscience professor at Suwa Tokyo Science University has found that building lots of tiny plastic robots could make you a genius. If you've ever stopped by my desk here at The Escapist HQ (or seen it in any of our Escapist Presents videos) you know this: I have a lot of little plastic robots cluttering up my desktop. And to be honest, I've always considered myself to be a pretty darn smart guy. I used to wonder if the two were related, and now I have incontrovertible proof that they are. Well, it's like incontrovertible proof. It's science - that's the same thing, right? 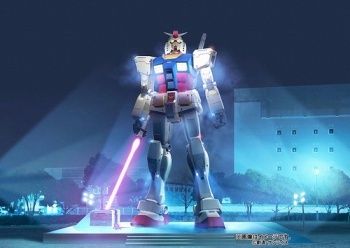 Kikunori Shinohara, a professor in the Neuroscience department of Suwa Tokyo Science University, announced that building Gundam models (or Gunpla which is short for "Gundam plastic model") was healthy for the human brain. The act of putting the model together promotes blood circulation in the brain, said Shinohara-san, which lets it "concentrate better, react better and remember better." It's true that there's a lot of concentration that goes into building these things. Professor Shinohara could well be right, in that they require very fine muscle control, focus, the ability to think in three dimensions, and a hell of a lot of patience when you can't complete that one goddamn kit because the screw you need is stripped and stuck halfway in and you can't do a goddamn thing with ... er, sorry, I got a bit sidetracked. Of course, there's always the chance that this could be the Brain Training thing, where building Gundam models only makes your brain better at building Gundam models. But really, you'd think that a neuroscience professor would know what he was talking about, right? Shinohara encouraged people of all ages to build models to promote brain health. Way ahead of you, dude. Way ahead of you.